Marriott has a pretty impressive approach to open innovation. Their “Travel Brilliantly” platform encourages anyone to submit an idea to improve any part of the Marriott experience. My favorite thing about it is that submissions are limited to 500 characters. No images, no flashy presentations, and no overly-lengthy explanations allowed. Just pure, simple, concise ideas. Last month, the #TravelBrilliantly Co-Creation challenge focused on improving Health & Wellness offerings at their properties. Hotel fitness centers are kind of a mixed bag. Once in a while you will be impressed by one that’s roomy, clean, and full of great equipment. More often than not, you’ll find yourself in a sad closet with a dingy stationary bike and a dusty treadmill. The fitness industry is growing. While few travelers choose a hotel based on its exercise equipment, hotels are stepping up their game. Initially I thought of new equipment or features that would be interesting in fitness centers, or ways for guests to get exercise in their rooms. I tried to temper those ideas against the need to deploy the idea easily across Marriott’s 4000+ properties without sticker shock, major renovations, or logistics challenges. A good idea becomes a great idea if it’s low cost, low-risk, and easy to implement. Running was one of the first activities that came to mind. It has many advantages for the traveler: it’s easily scalable to walking or jogging for those of different fitness levels; it’s a great way to explore surrounding neighborhoods; it requires almost no specialized equipment; it appeals to all age groups; and it can be a very social activity. It dawned on me that this could make Marriott the pivot at the center of exercise, exploration and socializing. There are few avenues for solo business travelers to meet new people outside of business gatherings or bars. Giving guests a way to make friends while bonding over a healthy activity puts Marriott in a unique position to be remembered as more than just lodging. Many runners, joggers and power walkers are used to running in groups while at home. 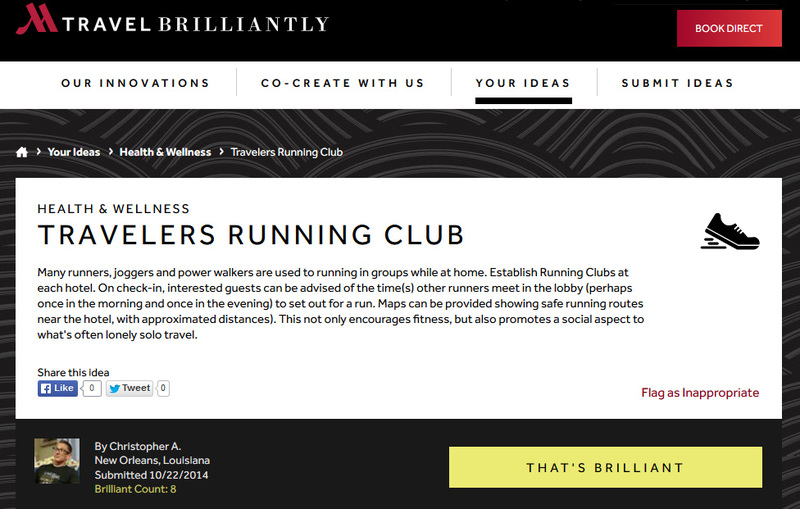 Establish Running Clubs at each hotel. On check-in, interested guests can be advised of the time(s) other runners meet in the lobby (perhaps once in the morning and once in the evening) to set out for a run. Maps can be provided showing safe running routes near the hotel, with approximated distances). This not only encourages fitness, but also promotes a social aspect to what’s often lonely solo travel. I was surprised to get an email today asking me to confirm my eligibility to win first place! Lace up your running shoes and cross your fingers, maybe I’ll catch you during a jog outside a Marriott somewhere in the near future?